Phishing is the number one way that the bad guys can gain access to your network. Phishing is the lowest cost, least technical, and easiest way to breach an enterprise’s external perimeter defenses and gain access to user credentials on the network. 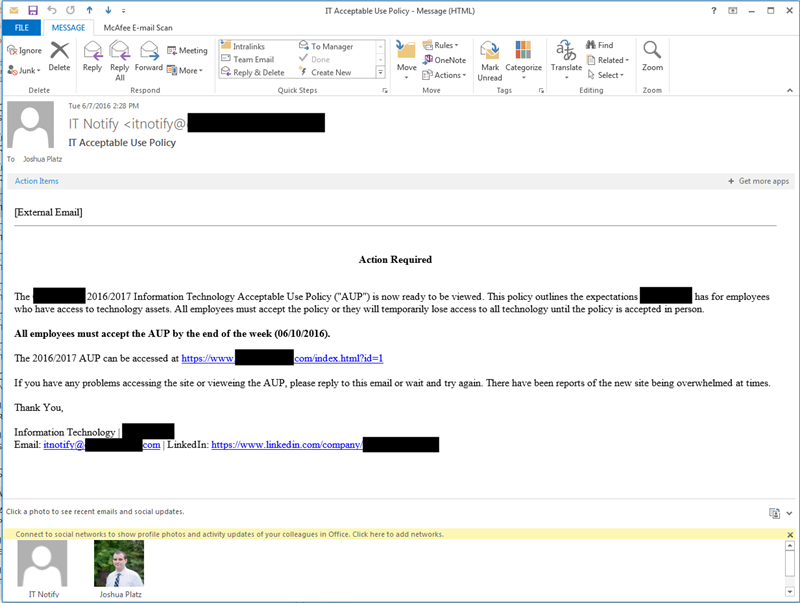 Phishing and spam emails have become so commonplace, that we expect to receive some unsolicited email from time to time. When spear phishing is leveraged, and specific companies and targets are selected, attackers have found that it is often easy enough to convince some users to click a phishing email. Once users click the link to the acceptable use policy website, they are directed to a website with a similar design to that of the organization’s format. Often attackers will just clone and modify existing pages. In the example below, a custom form was created to encourage users to download the acceptable use policy. Depending on the victim’s browser, things may look different. 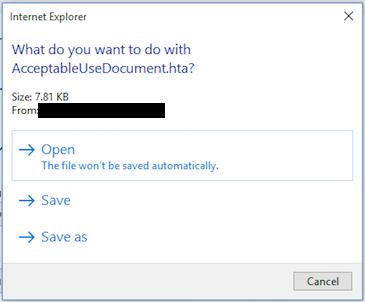 However, Internet Explorer users would be presented with an automatic popup asking them to open the file AcceptableUseDocument.hta. This file is actually an HTML application which is designed to execute PowerShell in order to receive a remote connection from the infected computer. 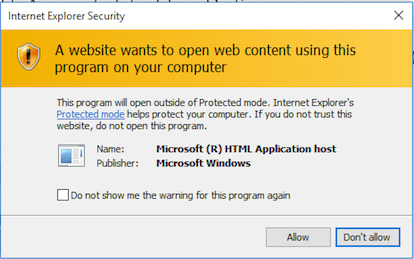 Once the victim clicks open on the malware, they are given a security warning about running untrusted files from websites. Typically people are jaded to these type of alerts and have become accustomed to just clicking through in order to get things to work. If the victim clicks accept, the remote connection is established and attackers have command line access to the infected machine along with the access to the user account who opened the malware. Unfortunately, the biggest weakness in any organization is the end user. It is critical that organizations do everything technically possible in order to minimize the amount of damage end users are exposed to. This means that the organization will need to implement a series of technical controls to harden end point workstations against the risk of phishing. 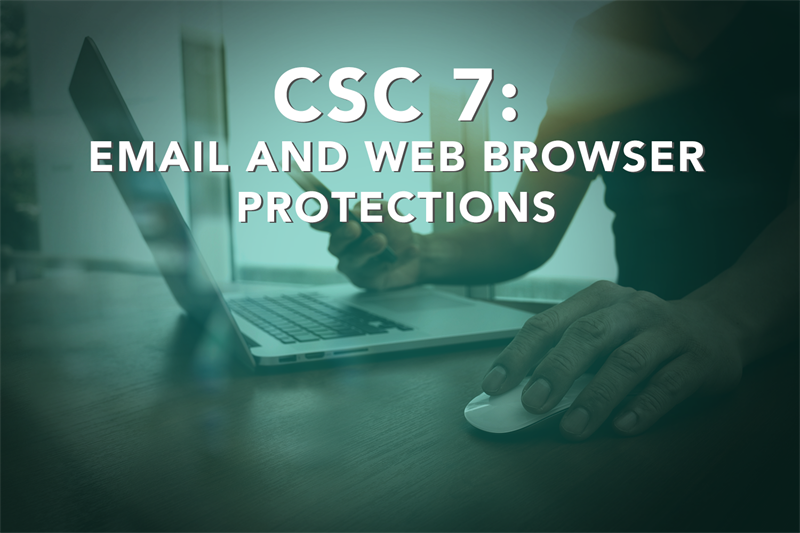 The first thing organizations should do is create a standard email and web browsing application suite. If the organization is going to use and support Internet Explorer and Outlook, ensure that the applications are running the latest supported version. Once the standard is defined, disable the use of all other browsers to ensure that only supported patched applications are being used. Within the browser and endpoint, there are several hardening settings that can be enabled. Organizations can determine which scripting languages are required for business activities and disable the languages that are not being used. For example, if ActiveX is not required, it should be disabled. Several server and network side mitigation controls exist as well, such as using a web proxy and performing URL filtering on specific categories of websites. If organizations are able to block uncategorized pages, for example, any fresh phishing site setup will not be accessible from the network. Email server hardening should also be performed in order to reduce the amount of spam and phishing messages that arrive in end users’ inboxes. If organizations institute a strong policy protecting endpoints as well as put mitigation controls in place on the network and email servers, the risk from email phishing is reduced, but it will never be eliminated. It is important to couple all of the technical controls instituted in this critical security control along with security awareness training in order to have the best defense against phishing. 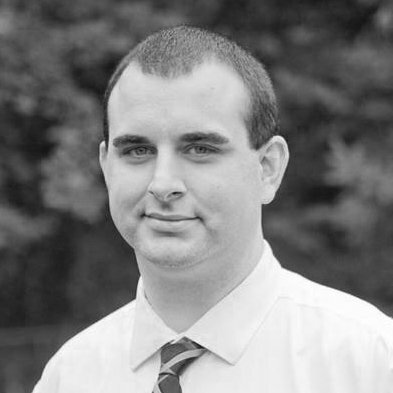 The next post will cover CSC 8: Malware Defenses.